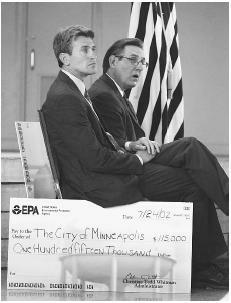 Minneapolis Mayor R. T. Ryback, left, and St. Paul Mayor Randy Kelly, right, listen during a 2002 meeting where Christine Whitman, head of the Environmental Protection Agency, presented each city with checks for $115,000 in EPA grants for water security planning. air. A recent example occurred in 1995, when the Japanese cult Aum Shinrikyo released sarin gas into the Tokyo subway system. The poisonous gas attack killed 12 people and sickened 5,000. Treatment and monitoring ensure that the water emerging from the treatment plant is safe to drink and that it remains that way all the way to the consumer's tap. However, these measures are not intended to thwart a deliberate act of sabotage. Many of the water treatment and distribution systems in use around the world were built decades ago. Domestic terrorism was virtually unknown at that time, and protective measures were seldom part of the system's design. For example, surface water supplies are often unguarded and exposed (unfenced, etc.). For large surface water supplies, the volume of water alone makes the possibility of deliberate contamination remote. For example, it has been estimated that the contamination of the Crystal Springs Reservoir that supplies some of the water for San Francisco, California with enough hydrogen cyanide to harm anyone who drinks a glass of water would require over 400,000 metric tons of the poison. Similarly, huge amounts of bacteria or viruses would be required. Poisoning smaller water sources, particularly after the water has left the treatment plant, is a more realistic possibility. Even if the water has been chlorinated, disease causing microorganisms such as Giardia and Cryptosporidium are resistant to chlorine, as are bacterial toxins. More than 100,000 communities in the United States obtain their water from a community well, without the benefit of chlorination or other treatment. Deliberate contamination of these systems could put millions of people at risk. Another security risk with water supplies involves the nature of monitoring the water. As of 2002, most monitoring techniques for living and nonliving contaminants requires up to 24 hours. "Real time" tests are not routinely available. Thus, contamination would not be detected until long after people had consumed the water. The release of toxic agents into a more limited area such as an office building is more plausible. Some buildings that are deemed to be a security risk, or which are used for research with highly infectious microbes, are equipped with safeguards to prevent the spread of airborne infectious agents or poisons. Air treatment, ventilation filters, alarms, and the ability to isolate contaminated zones are usually part of the designed safeguards. Drell, S. D. The New Terror: Facing the Threat of Biological and Chemical Weapons. Stanford, CA: Hoover Institute Press, 1999. Henderson, D. A., "The Looming Threat of Bioterrorism." Science no. 283 (1999): 1279–1282. Kowalski, W. J., W. P. Bahnfleth, and T. S. Whittam. "Filtration of Airborne Microorganisms: Modeling and Prediction." ASHRAE Transactions 105 (1999): 4–17. O'Toole, T. "Smallpox: An Attack Scenario." Emerging Infectious Diseases 5 (1999): 540–546.